Welcome back to the ForceCast! This week, Ryan and Daniel deliver another HUGE show! 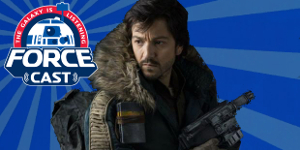 First, Diego Luna (Cassian Andor in Rogue One) joins the guys to discuss his experience making Rogue One. He also talks about his new film, Flatliners, and how you can help the victims of the Mexico City earthquake. Then, they play your voicemails and read your emails. The listener feedback spans from Rebels to J.J. Abrams. Peter Townley--the former host of The Star Wars Show-- joins the fellas for a wide-ranging discussion. Please, go to Diego's Omaze page and donate what you can to help the people of Mexico. Click HERE to do so. The Force Doth Awaken is out now! Ryan reads an excerpt from the book, which Quirk Books sent to the show.